SysRestore can restore your crashed operating system when it fails to start, has boot error, encounters blue screen, attacked by virus... 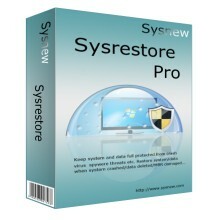 Restore your system and make your PC work in just a few seconds. If you add your disk into snapshot, deleted files due to various reasons can be restored. SysRestore can even let your preview the lost files before restoring snapshot. Copyright © 2012 Sysnew.com by Xia Software. All Rights Reserved.